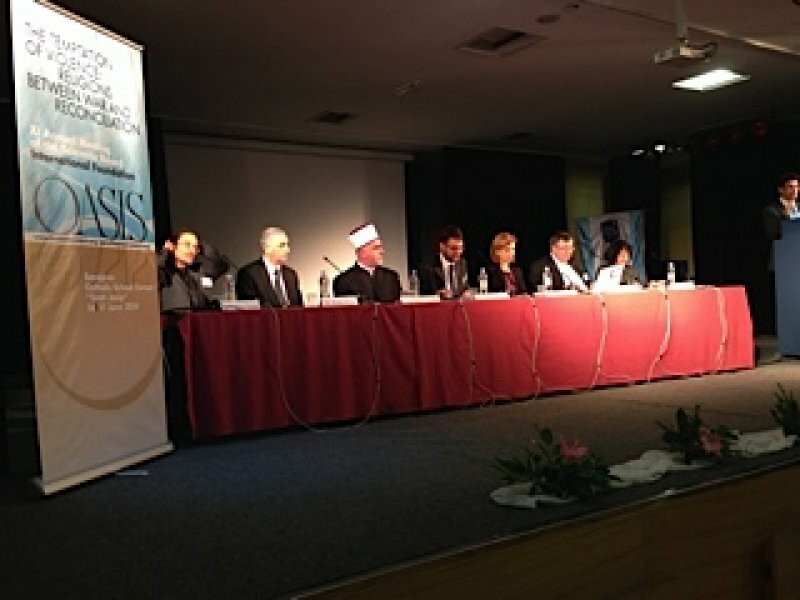 At the conference organised by the Oasis Foundation, participants presented several points of view about the meaning of jihad. Originally intended in spiritual terms, the concept has gradually been for political, economic and nationalist reasons. After the war in Bosnia-Herzegovina, Sarajevo is still an example of coexistence. An exegesis of the Qur'an is needed to save its religious core, whilst cleansing it of those aspects related to Muhammad's historical experience of 60 campaigns. Sarajevo (AsiaNews) - There are many ways of understanding "jihad", the holy war that is ravaging the Middle East (Syria and Iraq above all) and much of North Africa and Central Asia, an issue that was at the centre of this morning's Oasis conference in Sarajevo whose topic this year is 'The Temptation of Violence: Religions between War and Reconciliation'. Jihad as a war of aggression against the enemies of Islam (tepid Muslims, pagans, Westerners) is only one of the interpretations, albeit the one that makes the headlines. Yet, the "conflict of interpretations" over the term shows even more how urgent it is for the Qur'an and the Hadith (the prophet's sayings) to undergo an interpretation that saves the religious core of the Muslim faith whilst rejecting those parts that are related to the historic experiences of the Prophet Muhammad, as he fought his enemies in Madinah. The conference's host city, Card Vinko Puljic said, "has seen three wars," the First and Second World Wars, and that of 1992-95, which had some overtones of a "religious war" between Christians and Muslims, with Sarajevo - and its multi-religious character - becoming its emblematic victim. Among the participants, Asma Afsaruddin, a professor of Islamic studies at Indiana University (USA), offered one of the foremost presentations. In her careful study of the Koran, she shows that according to the Muslim holy book, the term "jihad" has always had an "ethical and moral" side, of "stoic, non-violent" resistance to evil. Even during the Madinah period (Muhammad's second period according to Qur'anic scholars), the reference to jihad only appears in reference to "the protection of life and property" against enemies and any "counterattack has to be proportional to the original attack". For Prof Afsaruddin, it is only during the Abbasid period (8th-13th centuries) that jihad became a political tool providing a religious justification for a desire to expand the caliphate. Then as now, some scholars, thinkers and religious figures stood apart, focusing on the "inner" and moral side of jihad, condemning even "martyrdom" as a means to destroy the enemies of Islam. Another scholar, Mathieu Terrier, from the École Pratique des Hautes Etudes in Paris, described the evolution of jihad in the Shia world. The persecution of Ali and his followers, after the defeat in Karbala (when one of his sons, Hussein, is killed), led to a position of quietism and spiritual interpretation of jihad, transferring it to an apocalyptic plane, of the end of world, in which the Mahdi (the Messiah), together with ʿĪsā (Jesus), the archangels and angels would end evil and wipe out Ali's enemies once and for all. All those present had the same question. How could the term jihad become so manipulated to become the defining symbol for Islam's attitude towards the whole world - some sort of total war feared by many Islamophobes and lauded by Muslim extremists? A first answer came from the experience of some Christian and Muslim Sarajevo who warned against using Islam "for political, nationalistic, economic purposes." In Sarajevo, Reis-ul-ulema (Grand Mufti) Husein Kavazović pledged to curb and correct Wahhabi interpretations (based on Saudi Arabia's radical version of Islam) to foster coexistence between Muslims, Christians and agnostics for everyone's well-being. A response from a cultural point of view came from Fr Samir Khalil Samir, an Islam specialist, also present at the conference. "The politicisation of jihad is very old and does not date back only to the time of the Abbasids," he told AsiaNews. "It is present during Muhammad's lifetime. One of the collections of the prophet's sayings (hadith) is called the 'Book of raids', which lists more than 60 wars by Muhammad." Hence, "If Muhammad is 'the model par excellence' of the believer, then it is immediately clear that jihad has become like 'the sixth pillar of Islam," he noted. Therefore, "What is needed is an exegesis of the Qur'an, one that saves the religious core of the book but cleanses it of all those aspects too conditioned by the historical period in which Muhammad lived, like his struggles during his time in Madinah."